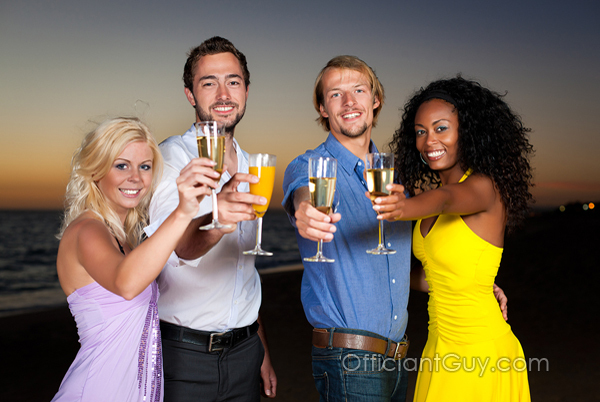 We have been wedding officiants for Double Weddings, weddings with two or more couples. Chris has been the wedding officiant many double weddings, triple weddings and quadruple weddings in Southern California. They’re fun! Some couples love the thought of a double wedding ceremony or a triple wedding and even a quadruple wedding. If your best friend or your sister or brother are getting married at the same time of you and your fiance you might consider double weddings. The benefits are that you can celebrate together and that if you are shy, you can deflect the attention a bit more. You can choose to do your own separate wedding vows or you can incorporate your wedding vows and recite them together. Get creative. Create your own unique wedding ceremony reading. Your wedding vows are uniquely yours. They can make up all the relationships between each person. The Officiant Guy has performed many double marriage ceremonies, triple marriage ceremonies and quadruple wedding ceremonies, and he can issue two marriage licenses right before. How easy is that? Want to have a double wedding in Southern California? Call Chris. He is the best officiant in LA. 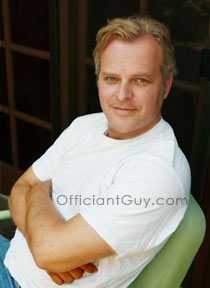 Officiant Guy is a California officiant for weddings. He has been marrying couples and issuing Los Angeles confidential marriage licenses for over dozens of years. If you are getting married anywhere in Los Angeles County give the most popular minister in Southern California a telephone call at (310) 882-5039 or (562) 547-3255 or fill out the contact form.